In its juvenile stage Browningia candelaris forms a very spiny solitary columnar stem up to 3 metres tall, but in age it start branching and loose lose all spines forming a candleholder tree up to more than 7 m tall, but usually much shorter (about 3 to 5 meters). The flowers and fruits are found only on the spineless adult branches, high enough to escape the grazing of herbivores. Origin and Habitat: Northern Chile and southern Peru in nearly as far north as Lima. Altitude: Between 1600 and 2800 metres above sea level. Habitat: It grows in the extremely arid Atacama desert.often in areas completely devoted of any other vegetation (it appear at times to be the only plant growing in its habitats) or elsewhere in association with other plant species, including the cacti Armatocereus matucanensis, Espostoa melanostele, Haageocereus pseudomelanostele, Weberbauerocereus weberbaueri, Neoraimondia arequipensis and Melocactus peruvianus. Precipitation is less than 200 mm per year, and may see years without any measurable rainfall, but even in their absence the plants continue to grow, though they may become scraggly and appear to be dead after years of rainless days. Where and when rains do occur, the plants turn green and appear robust and attractive. These cacti absorb scant moisture from the camanchaca that penetrates inland. Browningias appear to be especially vulnerable to damage by livestock grazing and all or nearly all young plants are eaten or trampled by goats. Young plants, those less than 2 m tall, are very rare. It grows very slowly. A 4.5 m tall Browningia candelaris would be 430 years old at such a rate of growth, and plants grow even more slowly and reach a much greater age in parts of the their range, where rains are as rare as leap years. In more moist regions, such as upper Canon Tinajas, young plants appear to grow more rapidly and bear a startling resemblance to slender young saguaros. 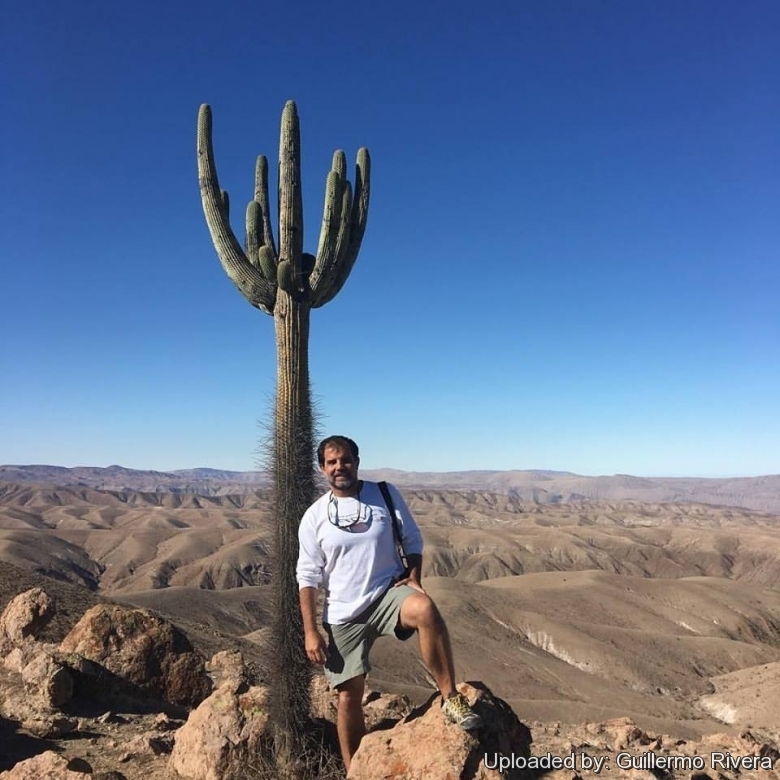 Description: Browningia candelaris is is a floristic Peruvian peculiarity and one of the most spectacular large candelabra cactus, with most grotesquely twisting branches springing from the apex of a straight very spiny trunk. The morphological behaviour of Browningia candelaris is also quite remarkable. In its juvenile stage it forms a very spiny solitary columnar stem up to 3 metres tall, but in age it start branching and loose lose all spines forming a candleholder tree up to more than 7 m tall, but usually much shorter (about 3 to 5 meters). 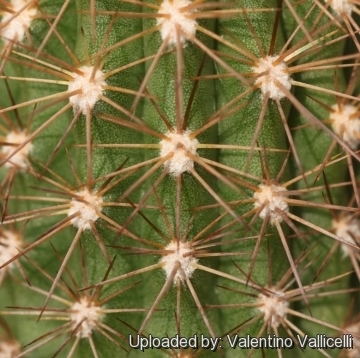 The adult cacti are so strange that they are nearly impossible to confuse with other species. The flowers and fruits are found only on the spineless adult branches, high enough to escape the grazing of herbivores. Stem: Trunk, about 2-3 m tall and 30-50 cm in diameter at base, erect, simple, tapering gradually upward, stoutly armoured by formidable spines that discourage predation by mega-herbivores and even by smaller ones. With time from the top of the trunk starts a cluster of sprawling cylindrical snakelike branches often curving downward. Seedlings and young branches are very spiny, but in age the branches on the top of the plant become completely spineless. These spineless branches are so different from the spiny trunk that seems that they have been screwed onto the straight trunk of an entirely different species. Ribs: All the stems have about 50 ribs. Spines: 20-50 on trunks, straight brown, 6–15 cm long. Spines continue to grow on the trunk throughout the life of the cactus. Above the trunk the thinner branching stems, may be entirely spineless or bear spines reduced to a few bristles. Spines few or absent on juvenile stems, yellowish brown, very thin, brownish black, to 1,3 cm long. Fruits: The fruits appear to be covered with scaly leaves, most unusual for cactus fruits and especially on a plant that seems perfectly adapted to withstand many months of no rain. Flowers: Tubular, white, 8–12 cm produced in the long spineless branches. It flowers once a year for only 24 hours. Fruits: Fleshy fruits, yellow when ripe and up to 7 cm long. The fruits are edible. 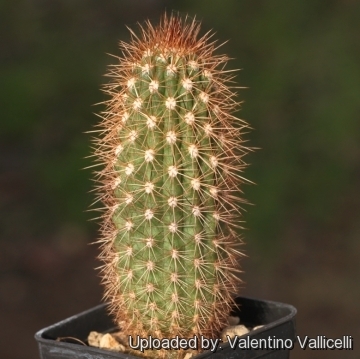 Cultivation and Propagation: Considering that Browningia candelaris comes from a habitat with an extremely arid climate, they are tolerant of pot culture, but exceedingly slow growing (5 mm to 10 mm per year). In cultivation a plant may reach a height of only 25 cm after about 25 years. These plants are susceptible to overwatering. They requires also an appropriate air circulation. 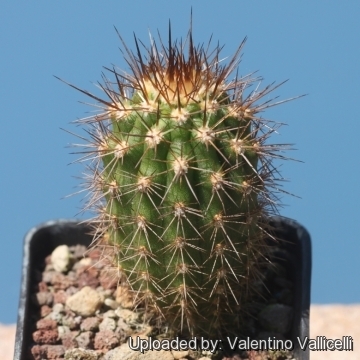 Exposition: Requires full sun or light shade and careful watering to keep plant compact with strong coloured spines. Light shadow my be useful in the hottest summer days. Uses: The fruits are sweet and widely gathered, weighing up to 200 g. Fruit production is spotty from year to year, however, and harvests are erratic, so the wild plants are not usually considered a reliable source of food. The wood of Browningia candelaris trunk is surprisingly tough and light, ideal for construction. The high-landers use all too readily for building - the principal reason for the species' rapid decline. Propagation: Seeds or offsets. Seeds germinate in 7-14 days at 21-27° C in spring, remove gradually the glass cover as soon the plants will be well rooted (ca 1-2 weeks) and keep ventilated, no full sun for young plants!